With more and more people accessing websites using the Internet on mobile phones nowadays, the need for a mobile friendly website is beneficial to provide maximum flexibility to web users who are constantly on the move. Here at Freestart Plc, we understand the demands of online business/website owners and have developed an easy to use mobile platform that easily works alongside your existing Freestart website. The beauty of our mobile website add-on is that it uses the same content you already have on your existing Freestart website. This means that you never have to double up on adding the content to both versions of your website. Whilst all the essential features of your Freestart website are still available through your mobile website, there are a couple of neat additions including a "Call" button to dial the number directly. Your mobile website also has direct integration with Google Maps providing you have entered a postal address on the contact page of the website. 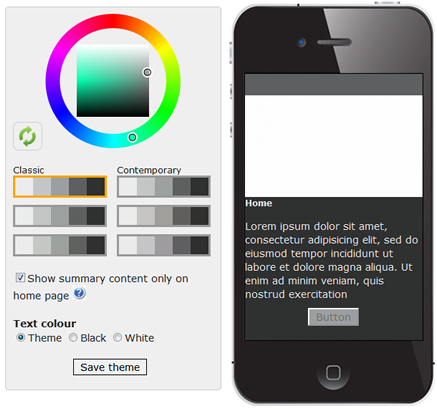 Under the Mobile tab in the Design Selection section of your control panel, you will find a colour wheel that allows you to select the colour scheme of your choice for your mobile website. You can choose the base colour by dragging the cursor in the outer circle and then define the shade of the colour by dragging the cursor in the square. You can then choose your colour scheme by selecting from one of the six swatches below the colour wheel and seeing the changes in the preview window. *Tip - You can click the Invert button to swap the light & dark colours of the colour scheme around. You can also set the default font colour of your mobile website to white, black, or to match the colour scheme you have chosen. You will then need to click the "Save Theme" button to save any changes you have made so far. *Note - If you have quite a lot of information on your home page, you can tick the box to "Show summary content only on home page". This displays just the first few paragraphs on the page to cut down on content that may make the page look too "bloated" on your mobile website. 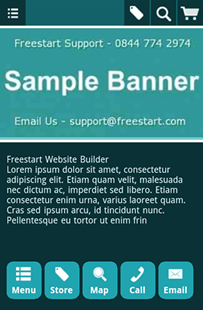 Adding a banner to your mobile website is easy! Simply click on the banner area of the preview and a pop-up box containing the files & folders on your computer will appear. After selecting your banner, you will need to drag the grey preview window across the Uploaded Image and resize to the desired size (any changes are automatically updated in the Banner Preview window to the right). 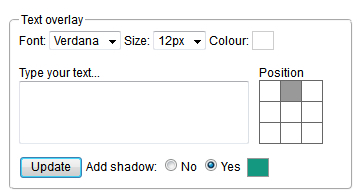 You also have a few options to enter your own text on the banner using the Text Overlay tool. This is useful if you wish to add additional text such as a telephone number or email address to your banner and can use the position grid to choose where you would like the text to appear in your banner. Click the Update button to apply the changes to your banner. Once you are happy with your banner, click the Save button to apply the banner to your mobile website. Alternatively, click Cancel to discard anything you have done with the banner so far. Even though your mobile website shares the same content as your desktop website, you do have control over what pages you want to have displayed on your mobile website. Navigate to Page Builder in your control panel and click onto the Sections tab to see the Mobile section under the Channel Sections subheading. Click on the Pages icon to see the list of pages on your website. You will then be presented with two columns: the one on the left will contain all pages currently set up on your website, whereas the one on the right (highlighted yellow) will contain all pages you have set to display on your mobile website. *Note - if it is your first time on this page, you may not have any pages listed under the column on the right. a) Custom Sort Type (default) - this allows you to easily drag and drop your pages into or out of the Section. Using the image above as an example, if we wanted to add the Services page to this section, you would just need to drag the box using your mouse to the right column (highlighted in yellow). You can reverse the process to remove any pages assigned to this section. Finally, click the Update button at the bottom of the screen to save your changes. 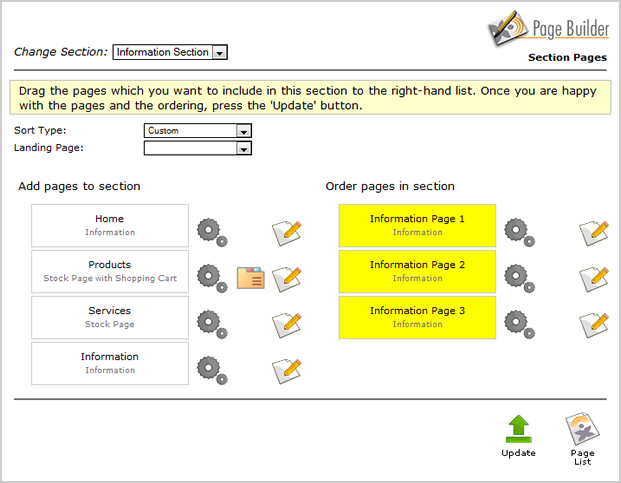 b) Alphabetical Sort Type - this allows you to organise the pages in your Section alphabetically. Additionally, you can add pages to the section by clicking the (+) next to any of the pages on the left. *Tip - You can quickly jump to the Page Settings, Stock Categories, and Page Contents by clicking the respective icons to the right of your pages on this screen.